The Renegade X is a rough trail rider's dream, with a robust shock package, host of race-inspired features and the capable and comfortable rMotion 137 rear suspension. RAS™ 2 Front suspension: A taller ski spindle, refined geometry and lighter components sharpen the sled’s already precise handling, especially in extreme conditions. 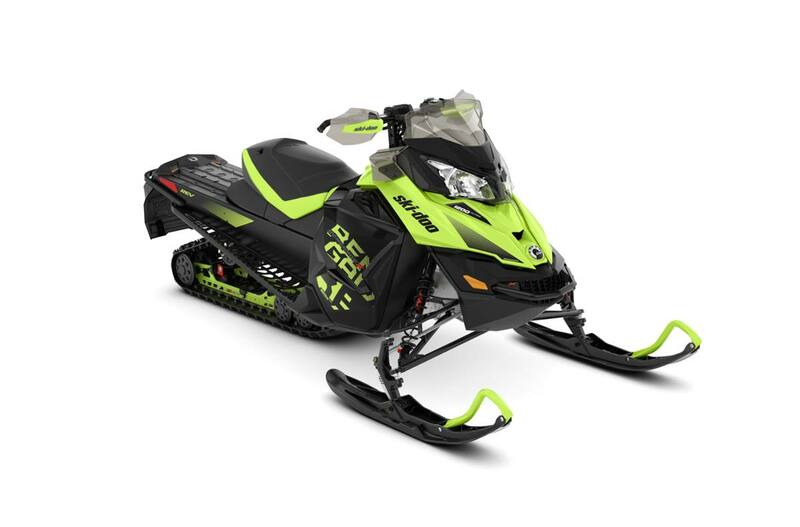 Transparent handguards: Their design increases protection and makes sleds look even lighter. They’re ready for industry-first LED accent lighting, flip-out mirrors and semi-rigid extensions. (Available as accessories). Adjustable Pilot™ TS Skis (option): Radical new concept enables the rider to literally dial in the amount of ski bite for conditions and riding style in seconds. A knob adjacent to the ski leg raises or lowers the ski runner – fully extended for a very aggressive bite. There are 20 settings over a .5 in. / 12.5 mm range. LinQ™ cargo system (option): Our cargo attachment system is the hassle-free way to connect cargo bags or a fuel caddy to your sled in seconds. Bore: 91 mm / 3.6 in. Stroke: 60 mm / 2.4 in. Vehicle overall length: 3,110 mm / 122.4 in. Vehicle overall width: 1,217 mm / 47.9 in. Vehicle overall height: 1,210 mm / 47.6 in. Ski stance: 1,077 mm / 42.4 in. Ski overall length: 1,066 mm / 42 in. Track nominal length: 3,487 mm / 137 in. Front suspension max. travel: 208 mm / 8.2 in. Rear suspension max. travel: 270 mm / 10.6 in. Riser block height: 130 mm / 5.1 in. Windshield: 285 mm / 12 in.